Once you travel to Onderon, you won't be able to travel anywhere else until you've concluded your business here. Atton: Well, this is Onderon. It looks like there's a long line to get into the Iziz Starport. Kreia: Something feels wrong here... a great disturbance here in orbit... and again on the planets below. Atton: I guess this blockade is a symptom of larger problems on Onderon. Mira: If they decide to do a cargo search, we're going to be in trouble. Com. Channel: The Ebon Hawk. I was told to expect your arrival. I don't know your business on Onderon, but it ends here. A group of six fighters attacks the Ebon Hawk, triggering a much wider space battle! Atton: We've taken some hits! We can try to fight back, or I can outrun them and hide us on the jungle moon nearby. It's your call. 1. I'll man the turret. Just keep her steady. 2. We'd better run for it. To the moon. Atton: I can't keep us in one piece much longer. Sorry to spoil your fun, but we've got to land now. I'm going to put us down on that jungle moon. Atton: You know, just once, I wish someone was glad to see us. But no, if it isn't weapons pointed at our heads, it's someone trying to blast us out if the sky. Atton: Well, the space battle's still going on overhead. Since they were so eager to use our hull for target practice, I doubt they're just going to forget us. I don't like it - Onderon is about as far from the Core as you can get and still be in the Republic. But even out here the locals have heard of us. We're lucky I was able to find this place to land - looks like something has cleared away the jungle in a few spots around here. 2. Where did we land? 2. Any idea where we are? Atton: It looks like one of the moons of Onderon, not sure which one. It's mostly jungle and mountain. I did pick up the remains of an old outpost near here. Maybe that's why there's all these clearings around - maybe they were once settlements. Kreia: There were no settlements here. Those clearings were most likely once craters... or crash sites. Kreia: This is Dxun, where the Mandalorians began their crusade against the Republic... the remains of whatever outposts you detected here are military ones. We should be careful. Atton: This is where the Mandalorian Wars started? This doesn't look much like a battlefield. Kreia: Much is buried here... and there is much that should remain buried. 3. How badly is the ship damaged? Atton: It's taken a little damage, nothing too serious. I'm shutting down all unnecessary systems until we make repairs. It'll keep us from being a target. 3. We need to get to Onderon. 4. Enough of this. How soon can we leave? Atton: Until the ship is repaired, we're not going anywhere. Unless you can find another route to Onderon, we should sit tight. Kreia: There may be a means to get to Onderon by another route. The Force has guided us here for a reason. We should explore our surroundings. There is... something here. Atton: Something? Oh, there's something here all right - predators. Not small Flipdarters, but big, mean, nasty predators. Kreia: Nevertheless, we should explore our surroundings... and that nearby outpost would be as good a place as any to begin. 2. We should stay with the ship. 3. Running around the jungle isn't a good idea. Atton: I agree. Going off alone is just asking for trouble - especially when there's no more reason for it other than a cryptic whim... no offense. 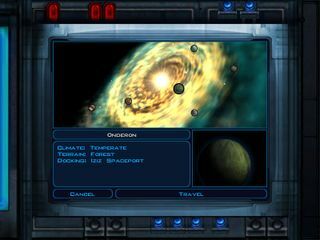 Kreia: If we hope to get to Onderon and leave this moon, then we need to explore this place. We landed here for a reason, I am certain of it. 1. Let's head to the outpost, then. 2. All right, let's head out. Atton: Well, if you go, be careful - no telling what other ships were forced down in the battle. Kreia: I have a feeling the ship will not be repaired until our business here is concluded. Do I make myself clear? Atton: Yeah... I understand. What's so important about this place? Kreia: This is where the Mandalorian Wars began. She fought here once, and there are things here she must see. Kreia: This is where the Mandalorian Wars began. He fought here once, and there are things here he must see. Atton: She fought here? Why didn't she say anything? Atton: He fought here? Why didn't he say anything? After your space battle above Onderon, you were forced to land on the jungle moon of Dxun. You need to find another way to get to the city of Iziz on Onderon so you can find the hidden Jedi master that might be there. 1. How are the repairs coming? Atton: The repairs are coming along. I hope to have the Ebon Hawk ready by the time you finish your business here.